We start out our second hour with a conversation with Mai Iskander, the filmmaker of Garbage Dreams, which will be shown at the Maryland Film Festival next weekend. For our monthly Urbanite special, we examine the benefits of eating raw honey. We learn about a sustainable business in Baltimore called Really Raw Honey. Finally, we’ll wrap things up with a conversation with Judy Kaye and Donald Corren, stars of Souvenir, the latest production at Baltimore’s Center Stage. The interview with Mr Walker was eceptional. The subject matter, bees and honey, seem to be insignificant in the lives of most people, however without bees our food supply would grind to an apocalyptic end. The efforts that Mr. Walker and others like minded people around the world to maintain the integrity of the bees, their health. which they do for temselves when left alone, their strenght, and their very nature to instinctively do their thing, is without parallel. 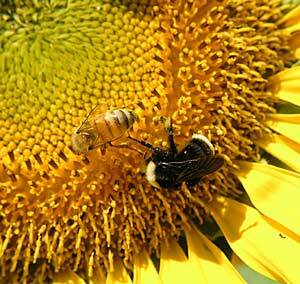 We need be grateful of all te benefits bees provide for mankind and allow the greed sindrome to end. Mark! the rest of the broadcast was also appreciated. It just take some time for the information to reach me in Panama.